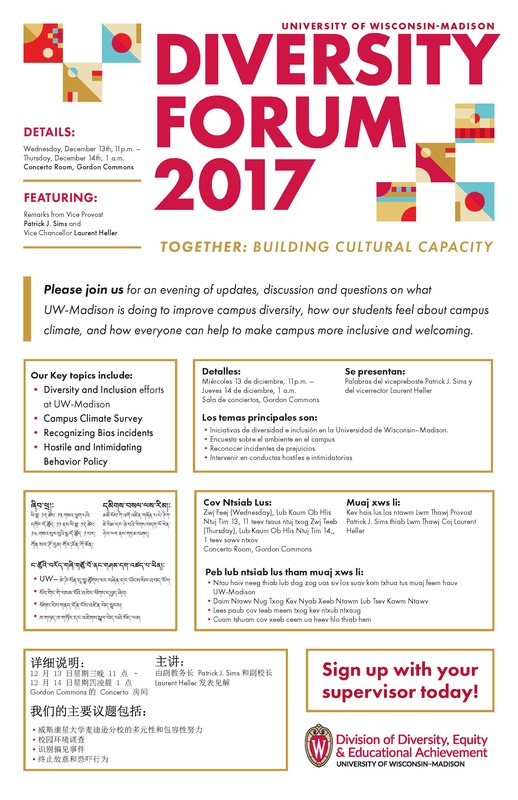 UW-Madison 2018 Diversity Forum featuring Talithia Williams, Ph.D.
For more than a decade, the UW-Madison campus has held annual all-campus and community forums to discuss, share and learn about contemporary issues on diversity and inclusion. With a more than 50-year history of creating and promoting initiatives designed to make the University a more globally inclusive institution to prepare leaders for a changing world and conduct cutting edge research, the Annual Diversity Forum has beome the premiere training and working session for diversity and inclusion topics. Now hosted by the Office of the Vice Provost and Chief Diversity Officer with more than 500 participants from the community and other campuses in attendance, one of the key components of the Forum in recent years has become the Community Forum Panel. Engaging speakers, presentations and round tables including topics ranging from integrated teaching and learning to police relations and the resurgence of traditional and emergence of new grassroots community advocacy groups have become a tradition. Lani Guinier, Civil Rights Attorney and First Tenured Black Woman Professor at Harvard. Other enhancements achieved with the partnership of co-sponsors have included an expansion of the Forum from one day to a second day of additional workshops and speakers, the inclusion of late night sessions to include our second- and third-shift employees, and a fledgling evening line up of sessions coordinated by and for students. Each year our staff puts on an amazing symposium for campus faculty and staff members, as well as students. This forum provides an engaging day of speakers, presentations and round tables at which campus diversity efforts are explored. 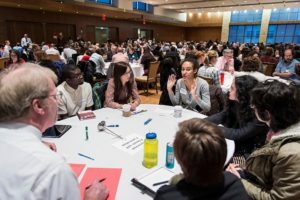 This year’s Annual Diversity Forum was a two-day event offering keynote speakers, break-out session, a Campus/Community Townhall Forum and second-day training workshops. See resources that were shared for both days below. 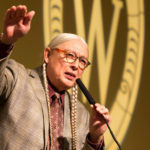 As a Native American rights attorney since 1973, Walter Echo-Hawk worked at the epicenter of a great social movement alongside visionary tribal leaders, visited tribes in indigenous habitats throughout North America, and was instrumental in the passage of landmark laws, including the Native American Graves Protection and Repatriation Act (1990) and the American Indian Religious Freedom Act Amendments (1994). 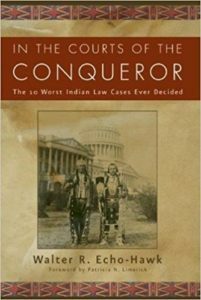 Echo-Hawk litigated in many of the epic struggles and has written extensively about the rise of modern Indian nations as a Native American author with first-hand experience, such as his groundbreaking book, In the Courts of the Conqueror: The 10 Worst Indian Law Cases Ever Decided (2010) . 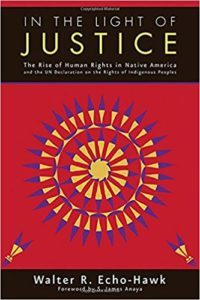 Echo-Hawk also signed copies of his book In the Light of Justice: The Rise of Human Rights in Native America and the UN Declaration on the Rights of Indigenous Peoples. Trump’s merit-based immigration system: Who would get in? 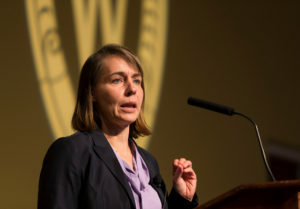 As the Director of UW-Madison Health for nearly a decade, the Day 2 featured keynote Dr. Sarah Van Orman helped UW–Madison navigate some of the toughest issues around: student mental health, high-risk drinking, sexual assault and outbreaks of meningitis and norovirus. 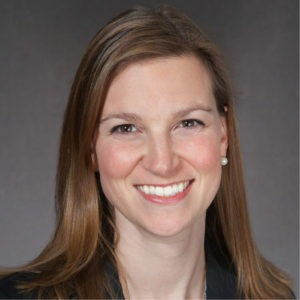 Van Orman is board-certified in both internal and pediatric medicine and she received her medical degree from Mayo Medical School. 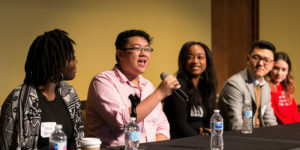 Simone Collins, Associate Director for Campus Based Services at University Health Services Mental Health, moderated a panel of diverse students discussing the challenges of navigating systems and institutions to overcome feeling excluded or marginalized. Students shared their challenges in the classroom and suggest what they need from professionals. 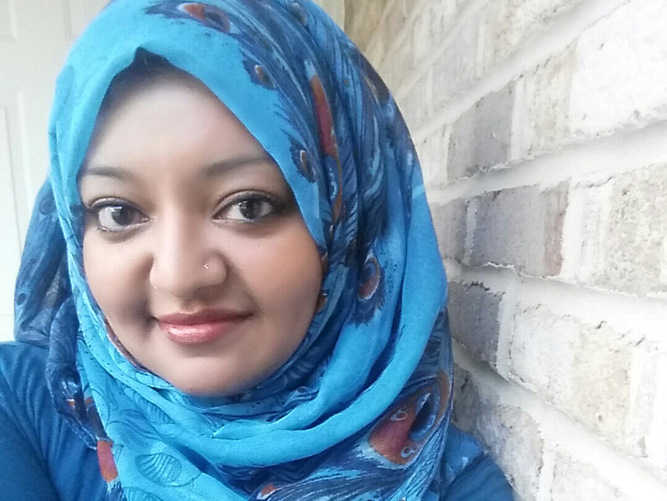 Keynote Speaker: Rabia Chaudry, a wife, mother, attorney, President of the Safe Nation Collaborative and a National Security Fellow at the New America Foundation. This year’s keynote speaker is Rabia Chaudry, a wife, mother, attorney, President of the Safe Nation Collaborative and a National Security Fellow at the New America Foundation, who is a civically engaged legal practitioner on federal immigration law, with experience in civil liberties and national security. Chaudry’s work with the New America Foundation focuses on the empowerment of and inclusion of American Muslim communities in the national security realm providing cultural competency training to law enforcement, correctional and homeland security officials and providing national security and vulnerability training to Muslim communities and institutions. Rabia is a 2016 Aspen Ideas Scholar, Fellow of the Truman National Security Project, a Fellow of the American Muslim Civic Leadership Institute, and a Fellow of the Shalom Hartman Institute. She is the public advocate of Adnan Syed, the wrongfully convicted man at the center of the most popular podcast in history, “Serial”, and is the co-producer and co-host of the podcast “Undisclosed”, with over 70 million downloads. Rabia is a frequent public speaker on CVE, civil rights, faith & gender. Her writing appears in dozens of outlets and her book, “Adnan’s Story” will be published in September 2016. 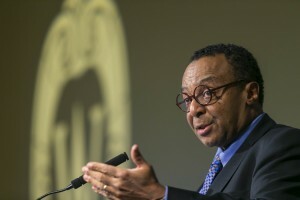 Clarence Page, the Pulitzer-winning columnist who was the keynote speaker at the UW-Madison Diversity Forum 2015 held November 3-4 at Union South, is someone who has seen it all, as much a reflection of his occupation as it is of his years. Page is not an “in-your-face” kind of speaker. Rather he is someone who uses the twist of a phrase to drive a point home, sometimes so subtly that the full depth and meaning of what he has said takes a moment to full appreciate. In addressing diversity, he recounted his own first discovery of segregation when he went to visit relatives in Alabama as a youth. His recounting of the episode reveals a type of loss of innocence as he came abruptly against the forces of segregation. 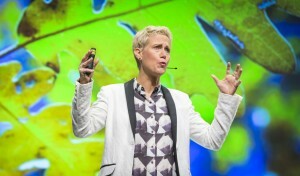 Rebecca Ryan is the author of ReGENERATION: A Manifesto for America’s Future Leaders (2013) and Live First, Work Second: Getting Inside the Head of the Next Generation (2007). As founder of Next Generation Consulting, Ryan leads the team that best-selling author Richard Florida calls, “One of the most reliable sources for leaders who want to attract and retain the next generation of creative workers. Peter Aranda, Executive Director and CEO of The Consortium for Graduate Study in Management, a non-profit alliance that includes some of the country’s best business schools, major corporations and sought-after MBA candidates spoke to Diversity Forum participants on Monday afternoon. 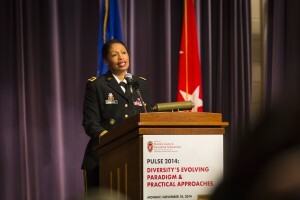 Major General Marcia Anderson, Acting Assistant Chief and Deputy Chief, Army Reserve, has served since 1 October 2011, as the senior advisor to the Chief, Army Reserve on policies and programs for the USAR including force structure, Congressional budget and appropriations process, development of manpower and personnel policies, as well as Department of The Army and Department of Defense Matters. 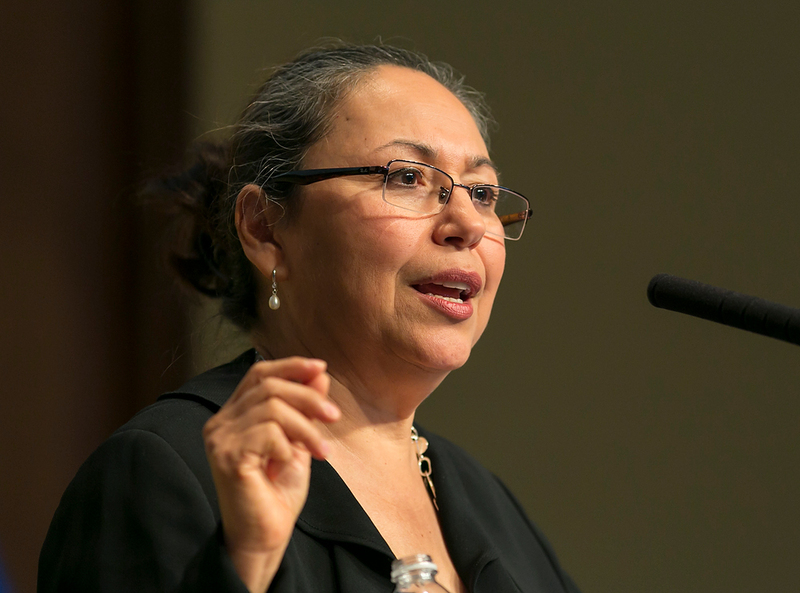 Morning keynote speaker Sylvia Hurtado spoke on the impact campus climate has on student success and development in higher education. As a professor and director of the Higher Education Research Institute at UCLA in the Graduate School of Education and Information Sciences, Hurtado also has been the Director of the Center for the Study of Higher and Post-secondary Education at the University of Michigan and was named by Black Issues In Higher Education among the top 15 influential faculty whose work has had an impact on the academy. 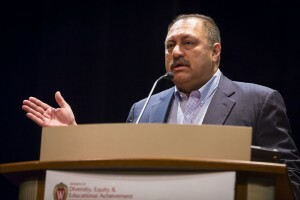 Hurtado recognized UW-Madison for being actively engaged in learning and training on diversity through the UCLA-based HERI before it was a hot topic. Afternoon keynote speaker Derald Wing Sue, a pioneer in the field of multicultural psychology, multicultural education, multicultural counseling and therapy, and the psychology of racism/antiracism, spoke about the impact of ‘micro-aggressions,’ or the small infractions of disrespect, that people inflict on one another both consciously and unconsciously. Derald Wing Sue is Professor of Counseling Psychology and Education in the Department of Counseling and Clinical Psychology at Teachers College and the School of Social Work, Columbia University. 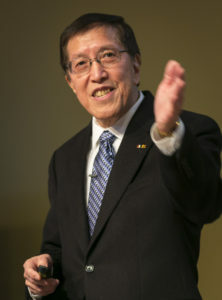 He was the Co-Founder and first President of the Asian American Psychological Association, past presidents of the Society for the Psychological Study of Ethnic Minority Issues and the Society of Counseling Psychology. Described as a pioneer in the field of multicultural psychology, multicultural education, multicultural counseling and therapy, and the psychology of racism/antiracism, he has done extensive multicultural research and writing in psychology and education long before the academic community perceived it favorably, and his theories and concepts have paved the way for a generation of younger scholars interested in issues of minority mental health and multicultural psychology. He is the author of several books, including Counseling the Culturally Diverse: Theory and Practice, Overcoming our Racism, and Understanding Abnormal Behavior. Katherine Lipper, J.D., EducationCounsel LLC. Katherine E. Lipper is a policy and legal advisor at EducationCounsel. 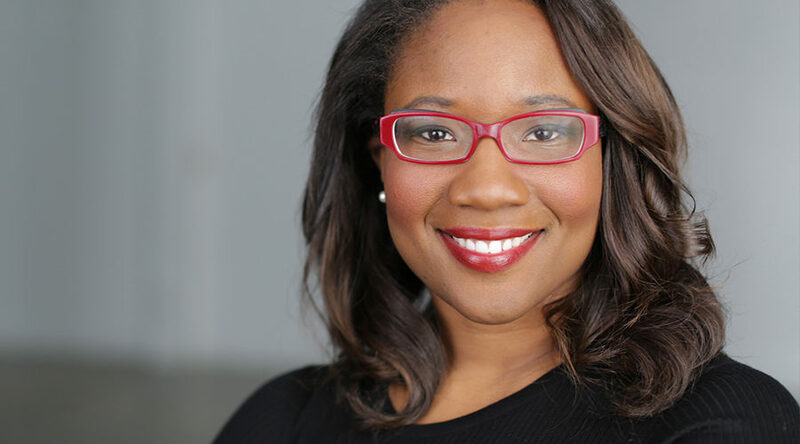 A former seventh grade English and reading teacher, she focuses on the issues of access and diversity in elementary, secondary, and higher education. While a member of the faculty of the University of Pennsylvania Law School, Guinier investigated the experience of women in law school, leading to the publication of a book, Becoming Gentlemen: Women, Law School and Institutional Change. She and her co-authors found that women were not graduating with top honors, although women and men came to the school with virtually identical credentials. The author of many articles and op-ed pieces on democratic theory, political representation, educational equity, and issues of race and gender, Guinier has written The Tyranny of the Majority (Free Press, 1994) about issues of political representation; Who’s Qualified? (Beacon Press, 2001) written with Susan Sturm about moving beyond affirmative action to reconsider the ways in which colleges admit all students; and The Miner’s Canary (Harvard Press, 2002), written with Gerald Torres about the experience of people of color as a warning or “canary” signaling larger institutional inequities. A graduate of Radcliffe College of Harvard University and Yale Law School, Guinier has received numerous awards, including the 1995 Margaret Brent Women Lawyers of Achievement Award from the American Bar Association’s Commission on Women in the Profession; the Champion of Democracy Award from the National Women’s Political Caucus; the Rosa Parks Award from the American Association for Affirmative Action; the Harvey Levin Teaching Award, given to her by the 1994 graduating class at the University of Pennsylvania; and the 2002 Sacks-Freund Teaching Award from Harvard Law School. She is the recipient of 11 honorary degrees from schools which include Smith College, Spelman College, Swarthmore College, and the University of the District of Columbia.